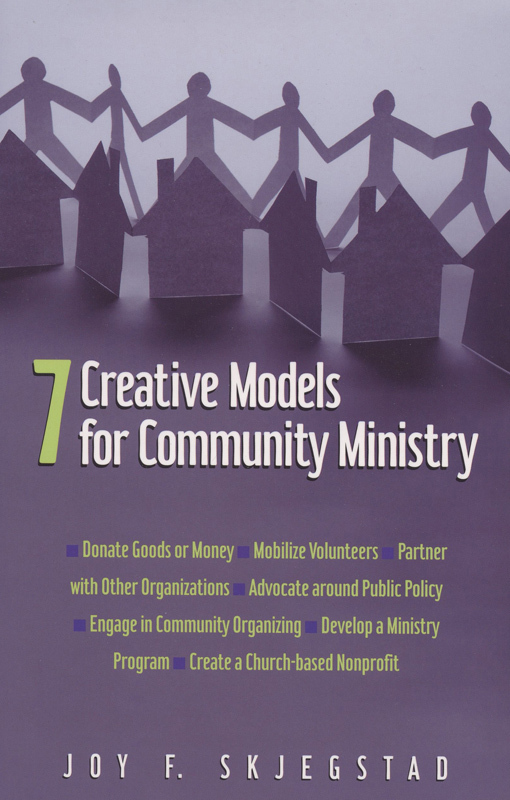 7 Creative Models for Community Ministry. Joy Skjegstad. Valley Forge: Judson Press, 2013. 211 pages. $13.59, paper. www.judsonpress.com. The latest book by Joy Skjegstad begins with an invitation and a promise: “This book is for you if you have already decided that your church should get more engaged with your community and you need to know what to do next.” I can think of no church that has good reason to decline her invitation. Nearly every church could use help to prime its engagement with its community. Skjegstad delivers on her promise to prime the discussion and to encourage action that makes a difference. 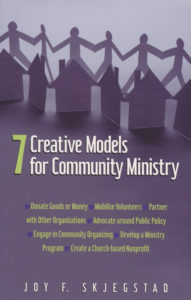 7 Creative Models for Community Ministry is a book for new churches that are considering how best to engage with their community in meaningful ways. It offers help for existing churches that are already engaged and just need to evaluate their efforts. Churches that are feeling “stuck” and recognize their need to re-connect with their community will benefit from reading, discussing, and implementing one or more of the models found here. Skjegstad offers help and hope to congregations that desire to engage with people and institutions outside of their four walls. While urban churches appear to be the focus, Skjegstad offers help and hope for rural and suburban congregations that want to make a difference and desire to engage with people and institutions outside of their four walls. That place is not found at a board meeting or a church basement coffee klatch. It is found by getting out and meeting the neighbors. The chapter, “Meeting the Neighbors: Ten Ways to Connect with the Community,” is one that every church leader should read with an eye on implementation in her or his community. The seven models invite the reader to consider a continuum from simple engagement through donating goods or money, mobilizing volunteers, and partnering with others, to community organizing, developing new ministries, to creating a church-based nonprofit. Leaders are invited to try one or more on for size, or to adopt a hybrid model that fits their community. Each model comes with a description illustrated by stories and simple suggestions for implementation. Pros and cons are offered to assist leaders in seeing the big picture. Each chapter concludes with a helpful “What You’ll Need” checklist. Scripture is offered as biblical support and foundation for the various models. Good stuff in here! This reviewer appreciated the emphasis on developing community assets by listening to and learning from the neighbors and community leaders. Unfortunately, many Christian people want to provide the ministry solutions for their community and offer help to their community without first listening. Listening is the starting point for doing ministry with the community. Skjegstad is adamant about listening and offering practical suggestions for effective listening to take place. Since nothing is perfect this side of heaven, I offer one suggestion which I believe would make this book even more solid as a guidebook for community engagement. I looked for a strong emphasis on the “why” of it all. Why should I engage with my community? Why would I want to get outside my church to build new ministries? Why would I take time to meet my neighbors and listen to their stories and commit to loving and serving my community? This book is written for Christian leaders and identifies scriptural bases for community engagement. Christian leaders need to start with the “why” which leads to the “whats” and “hows” of it all. This book is superb in the whats and hows. I missed the most compelling why for Christian leaders which focuses on more than meeting real human need and addressing critical social issues. The “sweet spot” of community ministry is where human needs and relationships meet and into which the Gospel proclamation (God’s story of reconciliation through Jesus Christ) enters. The “why” we do all this is so that we can authentically and humbly share God’s story with our neighbor. The result is transformation through holistic community ministry which brings healing to body, mind, and spirit. Peter A. Meier is executive director of The Center for United States Missions. A Lutheran Church—Missouri Synod pastor, he lives in Mayer, Minnesota.